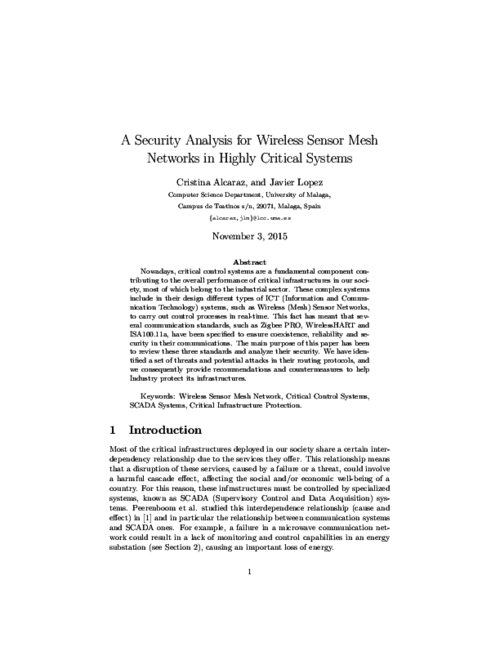 A Security Analysis for Wireless Sensor Mesh Networks in Highly Critical Systems | Network, Information and Computer Security Lab. Nowadays, critical control systems are a fundamental component contributing to the overall performance of critical infrastructures in our society, most of which belong to the industrial sector. These complex systems include in their design different types of information and communication technology systems, such as wireless (mesh) sensor networks, to carry out control processes in real time. This fact has meant that several communication standards, such as Zigbee PRO, WirelessHART, and ISA100.11a, have been specified to ensure coexistence, reliability, and security in their communications. The main purpose of this paper has been to review these three standards and analyze their security. We have identified a set of threats and potential attacks in their routing protocols, and we consequently provide recommendations and countermeasures to help Industry protect its infrastructures.